PSG fans seemed to turn on midfield star Adrien Rabiot before their clash against Toulouse this afternoon, amid reports linking the Frenchman with a switch to Barcelona. 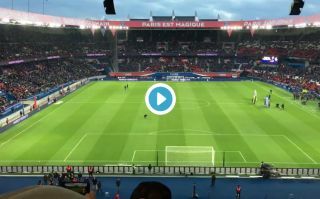 As seen in the video below, fans of the French giants can be heard booing the 23-year-old when his named is announced over the tannoy, something that may suggest that PSG supporters are beginning to turn on the midfielder. As per Mundo Deportivo, Rabiot is a target for Spanish giants Barcelona, and that the French international is keen to join Ernesto Valverde’s side in the summer. And it seems like this news has reached PSG fans everywhere, as it finally seems like they’ve lost faith in the midfielder prolonging his stay in Paris. Here’s a clip of PSG fans’ reaction to Rabiot’s name being read out before their match vs Toulouse, footage that’ll be music to the ears of Barcelona fans everywhere.